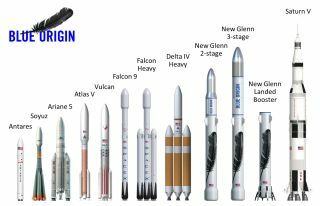 Blue Origin's newly announced New Glenn heavy-lift rockets will feature reusable first stages. The two- and three-stage versions will stand 270 feet (82 meters) and 313 feet (95 m) tall, respectively. The competition between billionaire space entrepreneurs Elon Musk and Jeff Bezos has reached new heights. On Monday (Sept. 12), Bezos announced that his company Blue Origin is developing a family of heavy-lift rockets known as New Glenn, after John Glenn, the first American to orbit the Earth. With a maximum height of 313 feet (95 meters), New Glenn will be taller than the 230-foot (70 m) Falcon Heavy, which Musk's SpaceX is building. The first stages of the Falcon Heavy (including the two strap-on boosters, which will be derived from Falcon 9 first stages) and New Glenn will be reusable, in keeping with the priorities of SpaceX and Blue Origin; both companies aim to slash the cost of spaceflight by landing and reflying their rockets multiple times. The two companies' parallel efforts to develop this technology spawned a minisquabble between Musk and Bezos in November 2015, after Blue Origin's New Shepard rocket landed during a suborbital test flight, becoming the first booster ever to do so. An artist's illustration of a SpaceX Falcon Heavy rocket at Launch Complex 39A at NASA's Kennedy Space Center in Florida. Bezos then pushed back, saying that SpaceX was trying to recover just the Falcon 9's first stage, which never makes it to orbit. "The second point that I would make is that the SpaceX first stage does an in-space deceleration burn to make their re-entry environment more benign," Bezos said during a news conference in November. "So if anything, the Blue Origin booster that we just flew and demonstrated may be the one that flies through the harsher re-entry environment. And then finally, the hardest part of vertical landing and reusability is probably the final landing segment, which is the same for both boosters." SpaceX succeeded in landing a Falcon 9 first stage in December 2015, during the launch of 11 satellites for the company Orbcomm. Since then, SpaceX has landed five more Falcon 9 first stages, some of them on terra firma near the launch pad and some on robotic "drone ships" stationed offshore. And Blue Origin has successfully launched and landed the same New Shepard first stage four times to date, most recently in June of this year. In his Monday announcement, Bezos said that the company's goal is to have New Glenn — which will have a two-stage variant and a three-stage version — up and running by 2020. Meanwhile, SpaceX representatives had said that the maiden flight of the Falcon Heavy should take place later this year, but that timeline may be in doubt as the company continues to investigate the explosion of a Falcon 9 during a routine prelaunch test on Sept. 1. Bezos and Musk aren't the only billionaires reshaping the spaceflight landscape. For example, Virgin Galactic was founded by British entrepreneur Richard Branson in 2004, and in 2011 Microsoft co-founder Paul Allen formed Stratolaunch Systems, which will launch satellites (and, eventually, crew-carrying vehicles) beneath the biggest airplane that has ever flown.